The coconut is one of the most used and grown nuts in the world, and the coconut tree is one of the most utilized palm trees in the world. The grainy coconut flesh is eaten raw or dried; the oil is used for cooking, as an ingredient in foods, and to make cosmetics, soaps and shampoos. Coconut trees grow best in warm climates in full sun. They can tolerate flooding, brackish water, salt spray and wind. Most insects on coconut trees cause little damage and do not require chemical treatment. The Acathrix trymatus mite has a tiny, whitish, worm-like body and lives in the folds of emerging fronds on coconut trees, according to the University of Florida. This insect can be seen in the spring and fall but is difficult to find during the summer. 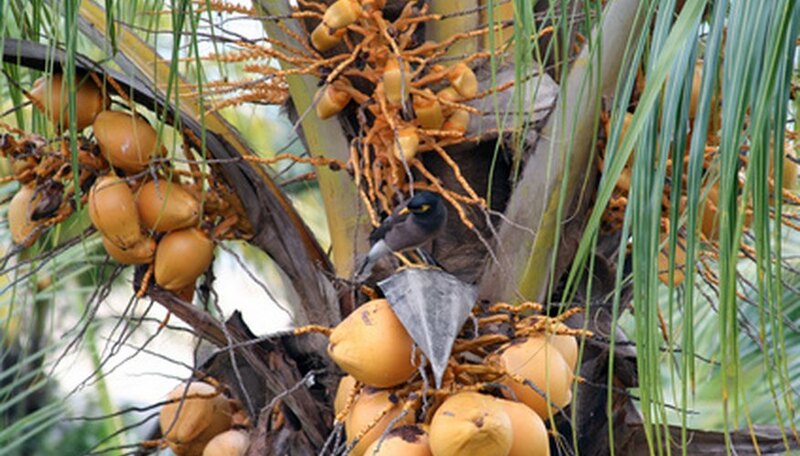 It is more common on coconut trees that suffer from lethal yellowing disease. There is no evidence that the Acathrix mite transmits diseases or causes any damage to infested trees. The Aceria guerreronis mite is one of the worst pests on coconut trees, according to the University of Florida. The microscopic mites form dense colonies and feed on the coconuts. This results in scarred and deformed nuts that turn brown prematurely and fall off before they are ripe. Chemical controls are not effective on Aceria mites, but some biological controls may reduce the infestations. Diseased fruit can be pruned and destroyed to prevent the spread of the mites. The red palm mite, Raoiella indica, is a serious pest on coconut, date and other palm trees, in addition to banana plants. Young palm trees are more susceptible to damage than mature trees. The mites feed on the underside of the lower leaves, causing extensive yellowing of the foliage. Female red palm mites are red with darker patches; the males are solid red. They are also known as coconut mites, scarlet mites, coconut red mites, red date palm mites, frond crimson mites, and leaflet false spider mite. According to the University of Florida, most chemical controls for red palm mites have not been approved for use on palms or bananas in the United States. Several other kinds of pests that cause minimal damage to the foliage of coconut trees usually do not need any type of control. These include caterpillars, mealybugs, palm aphids, palm weevils and other type of spider mites.